With fall weather upon us, there’s nothing more satisfying than roasted Brussels sprouts and I’ve kicked it up a notch with parmesan cheese. 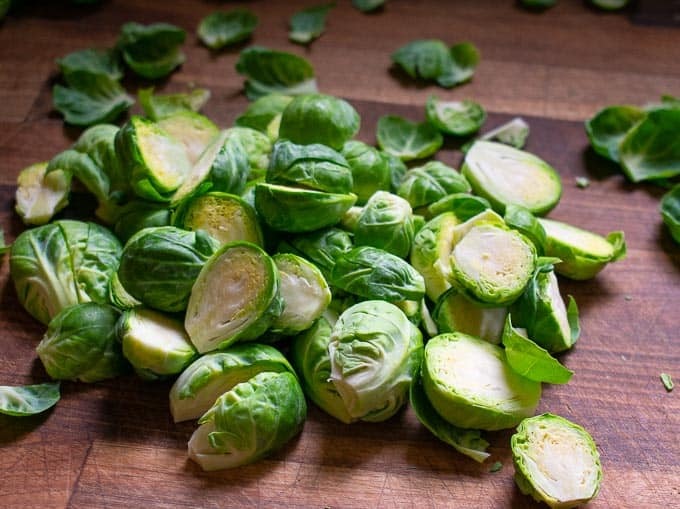 This is a foolproof method of roasting and will be my go-to recipe for Brussels sprouts. The secret is using a hot oven and enough olive oil to nicely coat them so they’ll brown well. They turn out crispy on the outside and tender on the inside. And the parm adds a nice salty flavor to the sprouts. I also put a little garlic powder on them for additional flavor. There are lots of additions that you can use to up the flavor, you might want to try: smoked paprika (1 tsp), Italian seasoning (2 tsp), balsamic vinegar and honey (1 tbsp and 1 tsp), bacon bits (2 or 3 strips of crispy bacon mixed in). Cut off the woody stems of the sprouts and discard the loose outer leaves. Slice them into halves (or quarters for the bigger ones). Place them into a gallon plastic bag and add the olive oil, garlic powder, salt, pepper, and half the parmesan. Shake and turn to coat. Next, pour them onto a large sheet pan which you’ve sprayed lightly with cooking oil, (bakers call this a half sheet size, 13″ by 18″). Turn most of the pieces so that the cut side is down. This will give the face of the sprouts a nice char. 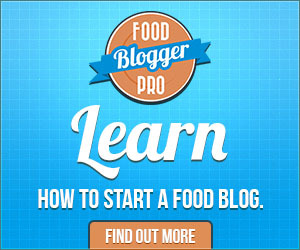 Place them in a preheated 425° oven, (or 400° convection oven), for 15 to 25 minutes. Give them a shake after 7 to 10 minutes to make sure they aren’t sticking. You can use a fork to check the tenderness of the veggies. They should come out nicely browned. Just scoop into a serving bowl and sprinkle with the remaining parmesan cheese. 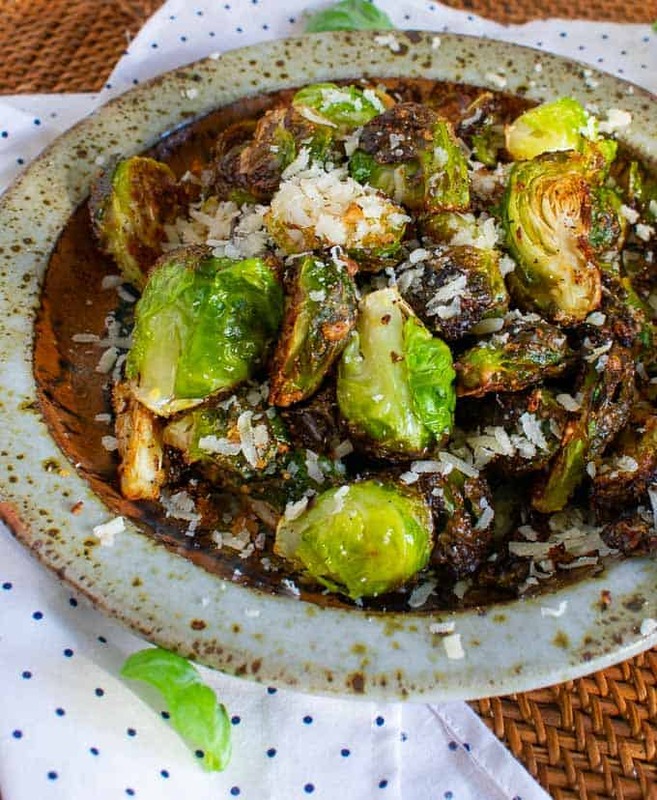 If you decide to use the balsamic and honey seasoning, mix 1 tablespoon balsamic vinegar, 1 teaspoon honey, and 2 teaspoons olive oil together, then pour over the roasted sprouts and toss to coat. 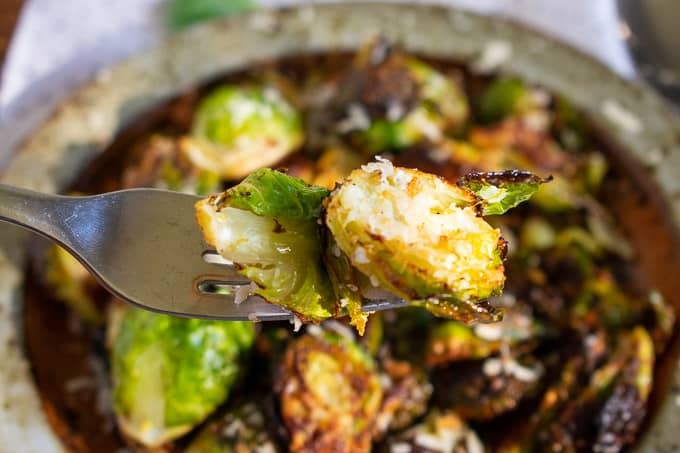 Whatever seasonings you use, this foolproof, roasted Brussels sprouts recipe is a keeper. Foolproof method of roasting Brussels sprouts and adding additional seasonings for flavor. Preheat oven to 425° or 400° convection oven. 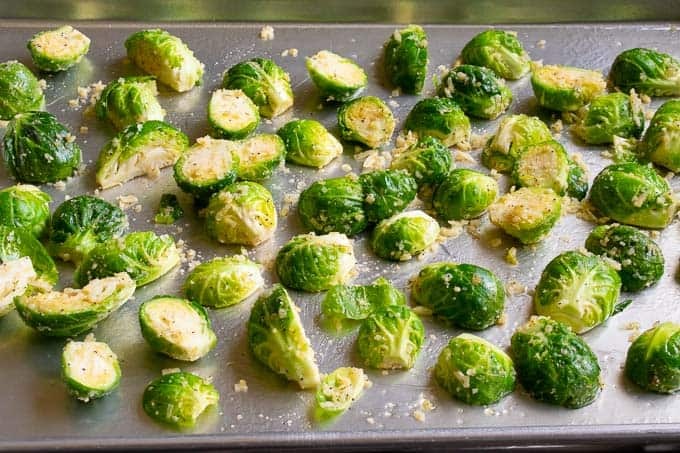 Place the halved sprouts into a 1 gallon plastic bag and add the olive oil, salt, pepper, garlic powder, and 1/2 of the grated parmesan and shake and turn to coat. Pour the sprouts onto a large baking sheet sprayed with cooking oil and turn most of the sprouts cut side down. Bake for 15 to 25 minutes, shaking the pan once after 7 to 10 minutes. Check for tenderness with a fork. The sprouts should be nicely browned on the outside and tender on the inside. 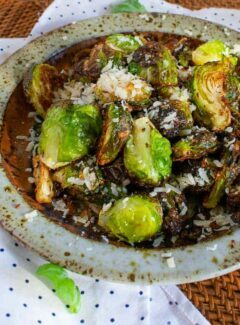 Scoop the sprouts into a serving bowl and sprinkle with the remaining parmesan cheese. 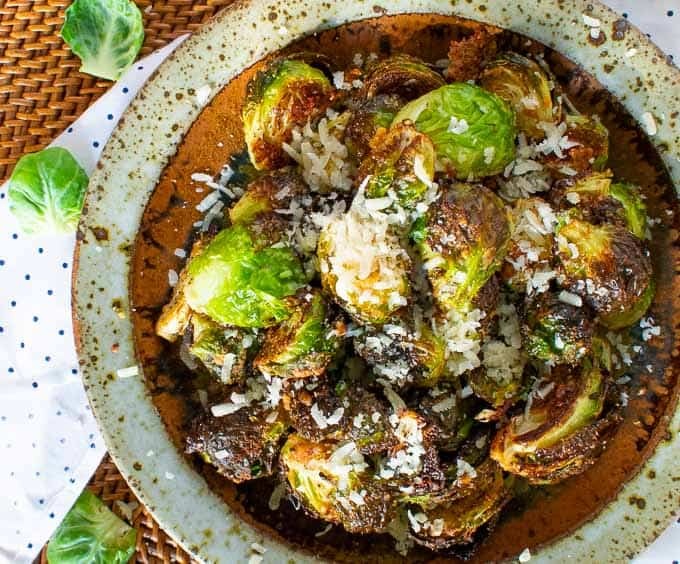 Optional seasonings: smoked paprika, 1 teaspoon; Italian seasoning, 2 teaspoons; balsamic vinegar and honey, 2 tablespoons balsamic, 1 teaspoon honey, 2 teaspoons olive oil stirred together and then drizzled over the roasted Brussels sprouts; bacon bits mixed with the roasted sprouts. Love this simple roasted brussels sprouts recipe! Just made it again tonight and it’s a keeper! My wife’s favorite vegetable is Brussels sprouts. Since she started roasting them they have become one of my favorites also. We will definitely try adding your Parmesan cheese suggestion, and may even experiment with some of your other spice recommendations. This is a great autumn side dish that’s easy to make but jazzes up any meal whether it’s for your family on a weeknight or special guests on a weekend.